Pictured is the Long family, from left to right, Angie, Kenzie, Josh, and Larry in front of the “in memory” tree they decorate each year in memory of Kaylee Long who passed away in 2014. Miss Teen Gallipolis in Lights Kenzie Long pictured in front of her sister Kaylee’s “in memory” tree. GALLIPOLIS — A family has made it one of their Christmas traditions to decorate a tree in memory of a loved one close to their hearts during the annual Gallipolis in Lights event. Angie Long shared she, along with her family members including husband Larry, daughter Kenzie, and son Josh, have been decorating a tree in memory of her daughter Kaylee since 2014. 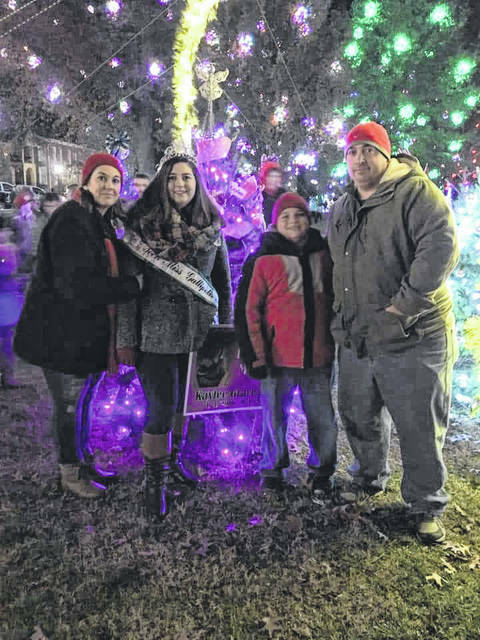 The inaugural Gallipolis in Lights was held in 2013, that following September in 2014 Kaylee, a third grader at Rio Grande Elementary, passed away unexpectedly. 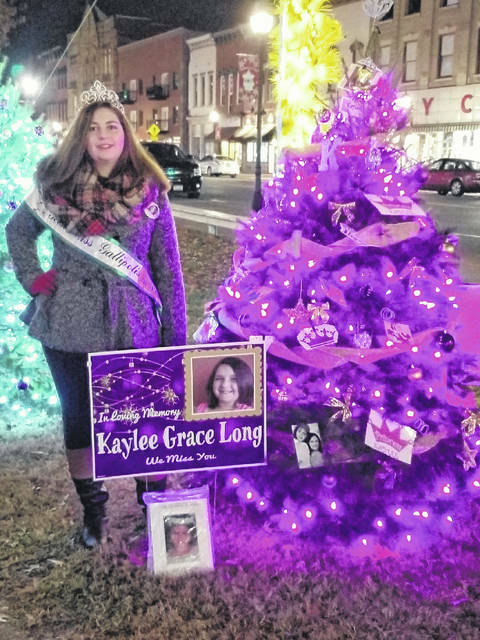 Angie said Shari Rocchi, an organizer and volunteer with Gallipolis in Lights, reached out to her, asking if Kaylee could be honored during Gallipolis in Lights, so Angie and her family made the very first “in memory” tree for the event. This year, individualized Christmas trees number over 200, including not only “in memory” trees but trees raising awareness about organizations, schools, churches, businesses and more. The trees line the walking paths through City Park. One of the worst nightmares of a parent, shared Angie, is the fear of their child being forgotten. By participating in Gallipolis in Lights each year, it it is a “great way to keep her (Kaylee’s) memory going,” she said. Decorating a tree for Kaylee is an important Christmas tradition for the Long family. Angie shared it keeps Kaylee’s spirit alive to them. “She (Kaylee) was an incredible person and she has inspired us to do better,” said Angie. Two years ago Angie decided to go back to school and pursue a career in the medical field and now has her Certified Medical Assistance (CMA) license. As with Angie, the rest of the Long family strive to be better in their lives too. Kenzie, who was recently crowned Miss Teen Gallipolis in Lights, has participated in the Gallipolis in Lights pageant for two years now. Angie shared participating in this pageant was very close to Kenzie’s heart. She said the entire family was “blown away” when Kenzie was announced as Miss Teen and it is “exciting” she gets to be involved in this way for the event. “It was like Kaylee had her hand in it,” said Angie. Families who participate in the decorating of an “in memory” tree for their loved ones can help “these people live on through the trees,” shared Angie. The Long family has started a research fund at Nationwide Children’s Hospital supporting the Midwest Pediatric Nephrology Consortium (MWPNC) in memory of Kaylee. For those who wish to donate by check, write Kaylee Long on “memo” or “for” line and mail to: Nationwide Children’s Hospital Foundation, Attn: Clinton Travis, PO Box 16810, Columbus, Ohio 43216-6810. Individuals may also call (614) 355-5417 to make a donation by card or discuss other methods of donation. https://www.mydailytribune.com/wp-content/uploads/sites/42/2018/12/web1_Trees2-1-.jpgPictured is the Long family, from left to right, Angie, Kenzie, Josh, and Larry in front of the “in memory” tree they decorate each year in memory of Kaylee Long who passed away in 2014.
https://www.mydailytribune.com/wp-content/uploads/sites/42/2018/12/web1_Trees2-2-.jpgMiss Teen Gallipolis in Lights Kenzie Long pictured in front of her sister Kaylee’s “in memory” tree.